Loretta Whitesides, co-creator of Yuri’s Night and founder astronaut at Virgin Galactic, adds to the conversation at Beyond the Cradle 2019. CAMBRIDGE, Mass. — Successful space travel is going to take a lot more than brawn, brains and tech. 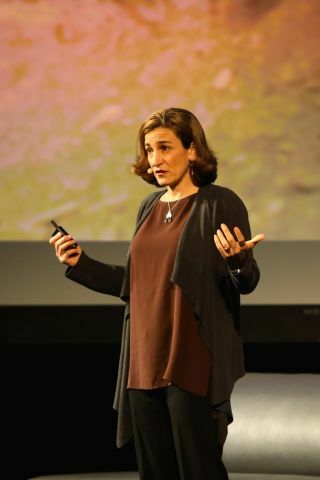 During a talk at the Beyond the Cradle conference on March 14 from the Massachusetts Institute of Technology Media Lab, Loretta Whitesides, author and soon-to-be "founder astronaut" aboard Virgin Galactic's SpaceShipTwo, VSS Unity, shared with the audience the new perspective on humanity and space flight she's gained in the past 14 years of holding her VSS Unity ticket. Whitesides will be on one of the first crews that gets to fly after the start of commercial service, which could happen as soon as next year, she told Space.com in an email. Tickets for the short flight are $250,000 apiece and would give passengers a few moments of weightlessness and the opportunity to view the curve of Earth, creating a powerful experience called the overview effect. Whitesides said during the panel that while the ability to go to space has been a lifelong dream of hers, there are still times she's struggled with whether or not she's ready to experience something so life-changing. "I've had this ticket for 14 years," Whitesides said. "And I think all the time about how we [can] make these space flights as profound and life-changing as possible. But I don't feel like I'm the person I've always wanted to be yet. I still forget my emails. When I'm stressed out I still lose it and yell at my kids." Whitesides said she probably won't become the full Jedi master she hopes to be by the time VSS Unity takes off, but that she hopes just training for space will help her begin to overcome those personal flaws. "I'm not going to come back to Earth magically healed," Whitesides said. "[But] I think that maybe just training for space will help me do all the growing-up I've been putting off. And maybe humanity training for space will help us as a species do the growing-up we need to do, that we've been putting off." In her book "The New Right Stuff" (Independently published, 2018) and in training classes for people in the space industry, Whitesides helps guide future astronauts and intergalactic citizens in learning what it means to train not only for space travel but for a life in space. Whitesides said her lessons to future spaceflyers focus on learning to really listen to one another, to resolve conflicts not just in their work but in their personal lives and to find learn to convey what their mission is — not just for a single flight, but in their lives. This mission of building community and communication through space is one that Whitesides has already successfully implemented by founding the yearly celebration of "Yuri's Night," an annual party in honor of the first crewed spaceflight, undertaken by Russian cosmonaut Yuri Gagarin on April 12, 1961. This international celebration brings together people around the world — and on the ISS — in celebration of Yuri's achievement and to honor his wish to "safeguard and enhance [Earth's] beauty — not destroy it." Whether on Earth or in space, Whitesides said it will be important that we work to create communities and culture we would want to live in. "We're going to need to be smart, strong and endure a lot," Whitesides said. "But the future requires more from us — asks more from us. It's also going to ask us to be authentic, to be vulnerable [and] to be honorable." Editor's Note: This article was corrected to reflect that Whitesides will be among the first crewmembers that gets to fly, but not on the inaugural flight. Follow Sarah Wells on Twitter @saraheswells. Follow us on Twitter @Spacedotcom and on Facebook.